Online information and helpsheets can be accessed 24/7 on the Citizens Advice website and some pages offer instant online help too: https://www.citizensadvice.org.uk/. See the full details and maps for our office and outreach locations on our Locations page. Our Aberystwyth office is open by appointment on Tuesdays and Thursdays, usually between 10 am-3 pm. Whilst we can sometimes give same-day advice, this cannot be guaranteed, but we will do our best to help. 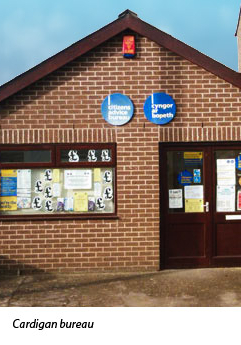 Our Cardigan office is open for ‘drop in’ general advice on Mondays and Thursdays from 10 am – 3 pm and by appointment at other times. Whilst we aim to give same-day advice at our ‘drop in’, this cannot be guaranteed, but we will do our best to help. Appointments for debt, energy advice, and benefits casework are available throughout the week by appointment. For debt issues call 01239 62 20 20 initially, or drop in.